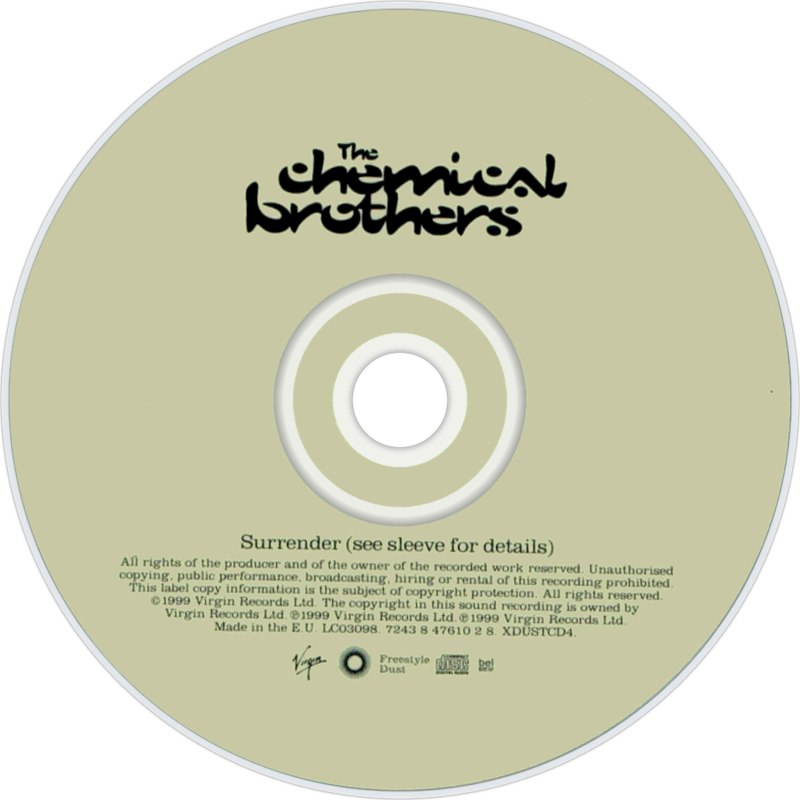 Surrender is the third studio album by British big beat duo The Chemical Brothers, released on 21 June 1999. 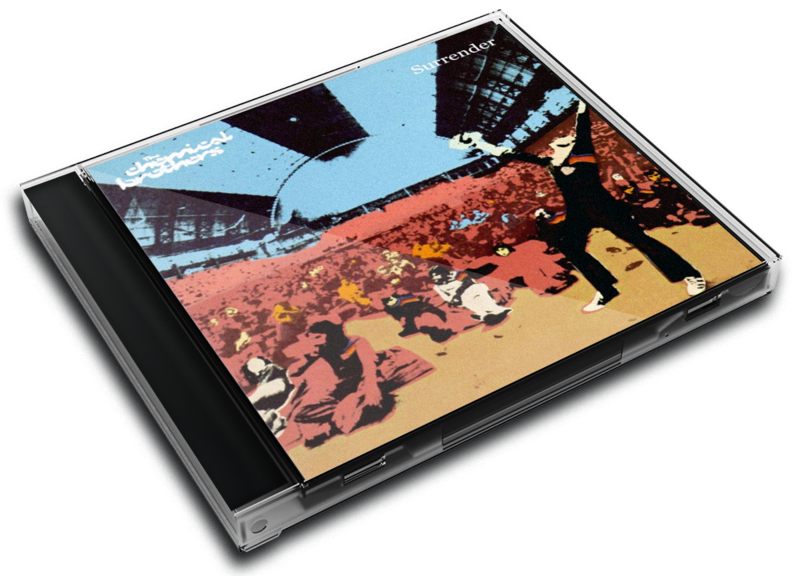 It features Noel Gallagher (Oasis), Hope Sandoval (ex-Mazzy Star), and Bernard Sumner (New Order) as guest vocalists. It was certified 2Ã— Platinum by the BPI on 30 September 2005. Leeds band The Sunshine Underground took their name from the sixth track on the album. 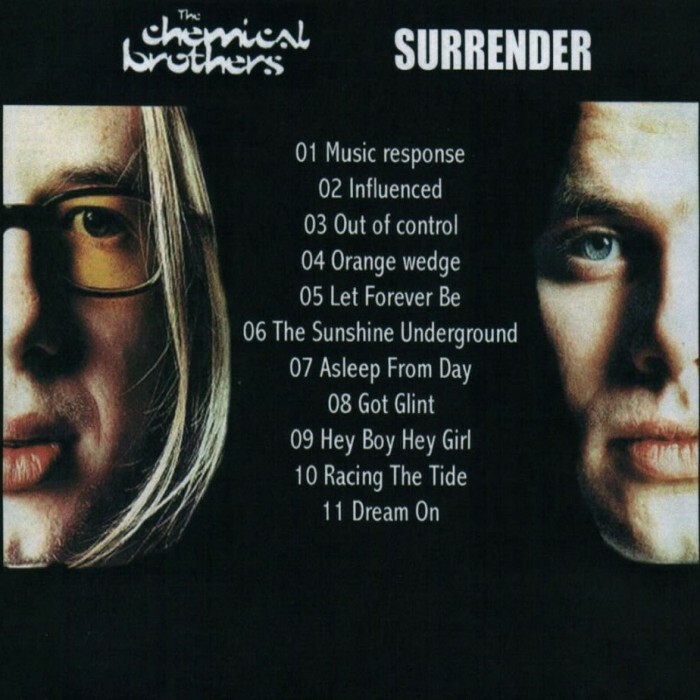 The song "Asleep from Day" was used in a 1999 television advertisement for the French airline Air France, as well as in an advertisement for the White Sheet Campaign by MADD Canada, and a trailer for the 2009 film The Vampire's Assistant. The album saw a change in style for the duo, moving from big beat to instead explore house. The album was the band's second number one album. Many of the artists that the duo worked with on this album, they would work with again. The duo were quick to work again with Bobby Gillespie, who appeares on the third track and third single "Out of Control", as they remixed Gillespie's Primal Scream song "Swstk Ys" (as it was titled on the 1999 single release) which later appeared on the band's 2000 album Xtrmntr. 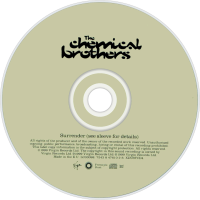 Surrender was the first Chemical Brothers album not to feature a guest appearance from Beth Orton, though she would appear on the following album Come with Us on the song "The State We're In". 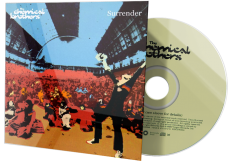 A special tour edition of the album was released in Australia and New Zealand, which contained a second disc of B-sides from the album. A long time before Hot Chip tried unsuccessfully to pair their raving shoes with a deeper, reflective soul, the Chems had it nailed down. On Surrender, arguably the finest album Tom Rowlands and Ed Simons have yet produced, the blend of big, banging anthems and strung-out chill tunes is almost perfectly wrought. There's a glut of cool and influential names involved, but regardless of the famous mates, the overwhelming feeling is one of resolute confidence and knowing execution. Under The Influence is still a pulversing, intoxicating test of bass-freaks and stereos. Out Of Control, with its trancey synths and Bernard Sumner vocal remains the best New Order song the Mancunians never recorded themselves. The Sunshine Underground? That epic supersedes its band namesake and continues to be a touchstone for any serious producer wishing to meld the downtempo with the dancefloor in one swoop. Aside from the obvious highlights, there are beatific surprises. Asleep From Day, easily overlooked on an album including Mercury Rev man Jonathan Donahue and Noel Gallagher, would settle gladly on a Boards Of Canada or Howling Bells record. It's contemplative and sweet like a summer evening just before the sun dips below the horizon. There are moments when the staggeringly high quality control dips slightly, like on Got Glint? But even then, the chunky beats and supple groove leaves the Brothers' contemporaries in the shade. No one should, or could, expect engaging lyrics or political depth on an album that is aimed to move mood to the highest heights via dancing. But these superstar DJs mastered the art of synth and beat urgency before Simian Mobile Disco or Justice even snagged a sniff of hipster recognition. It's almost a decade old but this mighty effort is still worth submitting to.